When I first told friends about my Japan Tsunami Marine Debris Monitoring volunteer work, they warned me about being radiated by the items I would find. I thought about buying a Geiger counter and searched online for a while but I was confused by the multiple models and eventually passed on the idea, like I often do when I am offered too many choices. 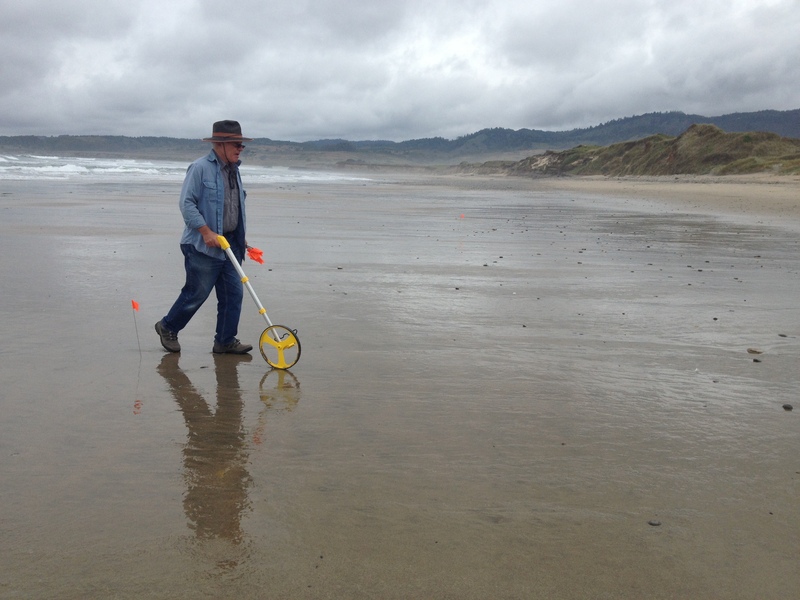 Ten months after starting my duty as a tsunami marine debris monitor, I head out to North Point Beach in Ano Nuevo State Reserve with much anticipation, not unlike a treasure hunter on the Bay Bridge heading early to Alameda for the flea market, hoping to find a unknown gem. The debris from the Japanese 2011 tsunami certainly won’t be treasures, but an eventual catalogue of items will be certainly mysterious and fantastic to trace back to their origins. Just over a month ago, a barnacled boat was confirmed by federal officials to be the first tsunami debris in California. Understanding how it traveled across the ocean to the US West Coast will also be remarkable for scientists. Watching what else shows up over time (and how long it takes to get here) will help us understand how big the problem is and will help us reduce possible impacts to our natural resources and coastal communities. Bob meticulously measures our transects. As for our work, each month my survey partner, Bob, and I set up four transects and catalogue debris within the 5-meter wide areas, each of them approximately 50 meters in length. On Monday, I found exactly one white bottlecap in that entire area. Bob, my debris monitoring partner, diligently measured the width of each transect after placing metal flag poles into the ground at the appropriate spots. Bob wonders out loud whether this is a good use of his time (even though he is retired). I, on the other hand, am what he calls a pushover because I head out in the early morning hours for the 1.5-hour drive each way with no complaints. In fact, even though we have found nothing in the 10 months we’ve been going to this beach, this is usually the highlight of my week even if I’ve been out late salsa dancing the night before. I like to watch how the area changes with the season, especially the beauty of the beach and the critters that elusively visit. I like to create stories that remind me of the immense realm that we humans don’t inhabit. This gallery shows what I photographed today at our beach. None of this was entered on any of the governmental documents that we will hand in. However, these images certainly prove that there is a vibrant and whirling existence that endures entirely without our involvement. That, somehow, is reassuring to me. This old Adobe house withering without attention. A photograph taken through the window. I couldn’t help but imagine what it would be like to wake up there during a rain storm. Pathway out to North Point Beach, Ano Nuevo State Park Reserve. It’s not the Bwindi Impenetrable Forest, but still is compelling. The path out to the beach, surrounded by Lupine. A close up of beautiful Lupine blooming. Footprints in the sand. We weren’t sure whether this was a cat preying on a deer or just a coincidence of footfalls. The toes are clearly delineated. Tracks traversed the edge of the beach. It appeared as though the animal was running. Running footsteps in the sand seem to be looking for an escape. This is the largest item that we’ve found to date. We don’t know what it is. It appears to be a large tripod (perhaps left by visitors from outer space). Roots unearthed by storms or wind. They weren’t there the last time we passed by this way.